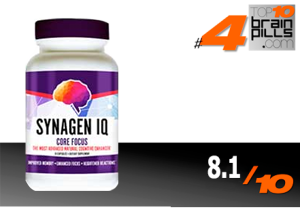 Synagen IQ Core Focus is a brain supplement promising focus with laser-like precision, whatever task or endeavor it is that one performs. Everyday intake is poised to provide the extra benefit of enhanced energy levels, as well as improved short- and long-term memory. The makers’ claim is that the product can boost “effective IQ,” a metric used for measuring practical cognition in a person. It is difficult to get hold of Synagen IQ’s complete ingredient list, but it does not divert from other brain pills’ claims that it’s scientifically formulated for supporting cognitive performance both in men and women, as well as in enhancing memory recall that most people are looking for. This commonly used stimulant anywhere in the world is a main ingredient, deemed a tried-and-tested nootropic that boosts energy and offers the brain a jolt of power that it often lacks every day. Caffeine is also projected to help users recall different pieces of information more quickly, solve problems better, and stay alert and awake. Fundamentally, it increases heart rate and blood flow to one’s brain, as well as causes slight mood alterations. This choline precursor is naturally occurring and can be found in foods such as red meats, organ tissues, or as synthesized in laboratories based on soy or egg enzymes. Choline proves to be a crucial component of brain health as it plays a part in decent neural function. Alpha-GPC is considered a potential neuroprotectant that can benefit users in the long run despite lacking the immediate jolt of energy from caffeine. Originally hailing from India, this herb is a star in nootropic supplements for its role in Ayurvedic medicine, potentially treating conditions such as anxiety, irritable bowel syndrome, back and joint pain, epilepsy, and fluid retention. It targets mental performance and is seen to help grow dendrites forming the neural connections in one’s brain just when it’s needed. Aside from the instant energy boost promised by caffeine, Synagen IQ is projected to serve a beneficial function in memory and cognitive abilities in people of all ages. This strikes us as a rather generic claim, but the brain supplement does not really divert much from the claims of other pills of its kind. It touches on common nootropic points as well as points to the long-term physiology and wellness of the brain. Caffeine is widely acknowledged to have a couple of possible side effects in its users, ranging from sweating and irritability to anxiety and more alarming ones such as heart arrhythmia. Alpha-GPC, on the other hand, is shown to be safe for most users although still occasionally linked to effects such as heartburn, headache, insomnia, skin rash, confusion, and dizziness. Bacopa Monnieri is not readily associated with common side effects attached to caffeine and Alpha-GPC, but the effects can be individual in nature and one has to take his or her own health and medical status in consideration. While numerous, Synagen IQ’s reviews online are not in the most flattering sphere, given one-star ratings and the citation of a number of side effects during therapy (without the presence of the promised benefits). At any rate, it appears to be the only product of its manufacturer Synagen, and it is available in 30-count bottles at $49.99 each. Five bottles of the same count are available at $149.95. From its online reputation and product presentation to our own product run, Synagen IQ smacks of mediocre performance. A complete list of ingredients could have been convincing and decent, but the lack of information paired with the potential for side effects are enough for beginners to old-timers in nootropic use to shy away and opt for more trusted and reputable brands. There is plenty that needs to be done to uplift the brand and improve its overall ranking in the widely competitive industry.